In general, I try to avoid sociology inside-baseball. I enjoy reading about the triple crisis in sociology as much as the next guy, but I tend to think we do well enough for ourselves. We aren’t running the world like economists, but we do teach an awful lot of students nationwide, are able to get our ideas into the mainstream press (even the New York Times), and sometimes into the State of the Union (I’d be remiss if I didn’t acknowledge Contexts’ and The Society Pages’ role in those enterprises). Still, I’d like to raise an issue that I believe poses a challenge to our field. In the past month, I’ve been stunned by two lists. The first is from Open Syllabus, which collects syllabi from around the web. There’s been some discussion about methodological issues, but I take this to be a fairly decent representation of where most sociology classes are especially at community colleges and other teaching institutions – where the majority of sociology students in this country are taught. As you can see below, the list is exclusively white, male, and old. With the exception of the Giddens and Babbie textbooks, they’re all canonical works (of course, it is a very incomplete canon). The second list came from the most recent issue of Footnotes and was assembled by Jerry Jacobs. 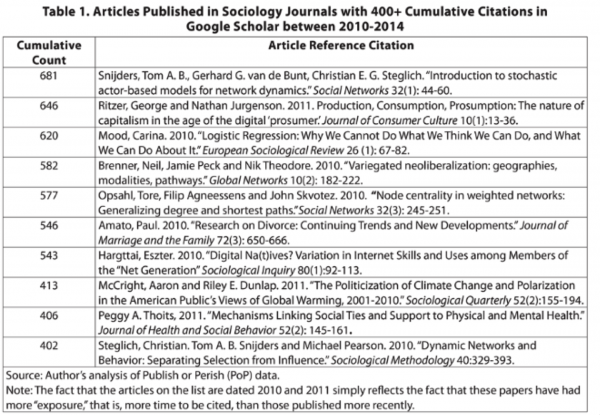 It represents the articles published between 2010 and 2014 that have been cited most frequently. Stochastic. Variegated neoliberalization. Node centrality. Even logistic regression. Are these terms most of our students learn? Nope. Via Footnotes, by Jerry Jacobs. Click for original. In other words, there is an enormous divide between where the field is and what we teach. That may not be true everywhere, but it is in many places. I’ve written before about how the experiences of ASA differ for faculty from teaching institutions and research institutions. But one of the biggest gaps is who we talk about in our classrooms. 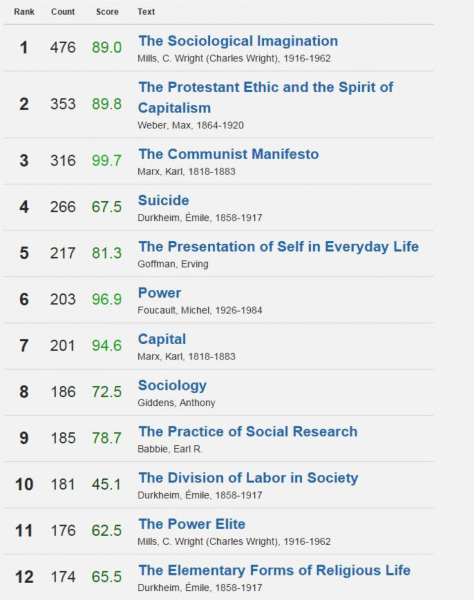 At liberal arts colleges, DuBois, Marx, Durkheim, Goffman, Ehrenreich, and Ritzer are big names and their ideas animate our classroom discussions. Rodney Stark once delivered a delightfully cantankerous presidential speech giving us hell for this “ancestor worship.” But there’s real value in understanding where we’ve come from and in offering students popularized texts. We need canon and we need to meet students where they are. But we also have a responsibility to introduce students to the field as it is today. That’s a big ask when the theoretical and technical complexity of the field has surged forward (especially since the 1990s with powerful computing widely accessible) and more students with limited reading and quantitative literacy skills have entered college. How do we address this gap? Some of the answers can probably be found in the pages of Teaching Sociology and on TRAILS. 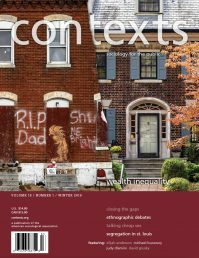 The Contexts Reader and The Society Pages do a great job of representing some current research in accessible ways. 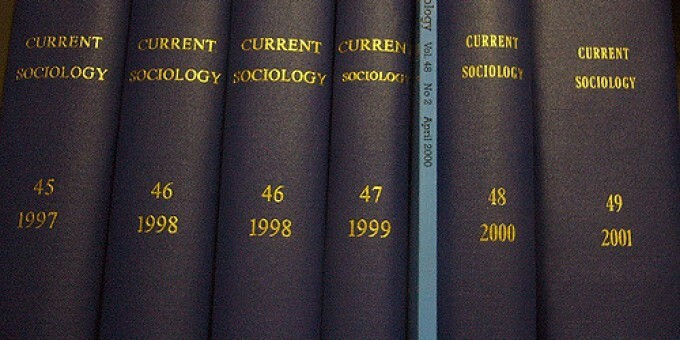 But I believe that it’s hard to have SOC101 students reading many original journal articles. For that reason, I think Methods and Statistics courses need to be points of intervention where we teach students how to read current literature in the field if we are to introduce students to the field as it is, not as it was. Andrew Lindner is in the department of sociology at Skidmore College. He is the Trends editor for Contexts Magazine. Same problem exists in statistics. We spend the first semester of an intro course teaching t-tests and z-tests, tools that never show up in our research. @ Mike: Consider McClendon Mckee's great social stats text: Statistical Analysis in the Social Sciences. It does everything with regression from the beginning.